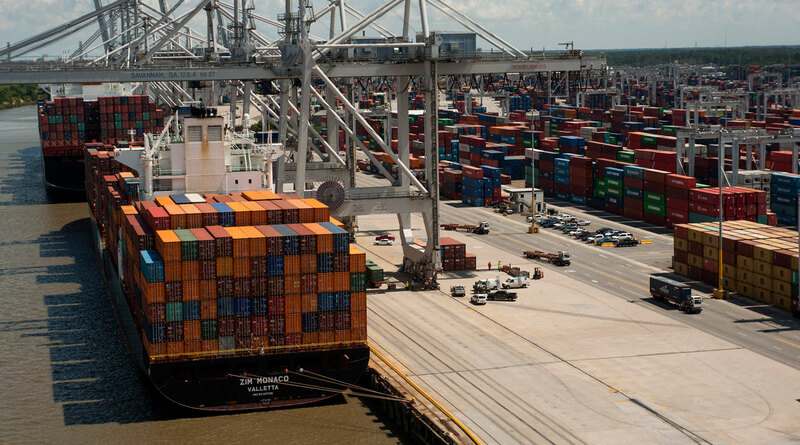 On Friday afternoon, the Port of Savannah expects the CMA CGM Theodore Roosevelt to dock as part of a caravan of ever-larger container vessels that have called on the fast-growing port since the opening of an expanded Panama Canal. The Roosevelt, longer than a Nimitz-class aircraft carrier, set a new record as the largest container ship ever to dock at an East Coast port when the vessel arrived in Virginia earlier this week. Griff Lynch, executive director of the Georgia Ports Authority, said his crew expects to move more than 5,000 containers on and off the ship, using seven enormous cranes. The seven cranes will be the first time the port has used so many to handle a single vessel, he said..
“The stakes get bigger,” Lynch said. In May, Savannah welcomed the Cosco Development, the first 13,000 TEU or 20-foot equivalent container ship to visit the East Coast. Since that time, Lynch said, the port has welcomed a new Neo-panamax class vessel practically every week. The Roosevelt carries 14,400 TEUs. The Savannah River is in the process of being deepened to help accommodate larger vessels. The U.S. Army Corps of Engineers’ project to deepen the channel from 42 feet to 47 feet is expected to cost nearly $1 billion and take until 2022 to complete. The state’s logistics industry is a crucial job creator. Freight that is shipped through Savannah often passes through warehouses in metro Atlanta.